Keala Joan Settle (born November 5, 1975) is an American actress and singer. Settle originated the role of Norma Valverde in Hands on a Hardbody, which ran on Broadway in 2013, and was nominated for the Outer Critics Circle Award, Drama Desk Award, and Tony Award for Best Featured Actress in a Musical. 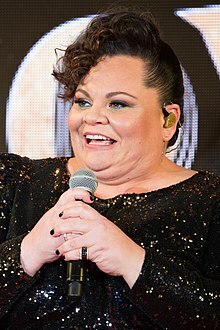 In 2017, she portrayed Lettie Lutz, a bearded lady, in the musical film The Greatest Showman. The song "This Is Me" from the film, principally sung by Settle, won the 2018 Golden Globe Award for Best Original Song, and was nominated for the Academy Award for Best Original Song. On January 27, 2019, Settle sang "Seasons of Love" in Fox's Rent: Live. Settle was born in Hawaii, the eldest of five children of Susanne (née Riwai), who is of Māori descent from New Zealand, and British-born David Settle. She is a graduate of Kahuku High School (class of 1993), and an alumna of Southern Utah University. Settle made her Broadway debut in 2011 in Priscilla, Queen of the Desert as Shirley and in the ensemble. Settle originated the role of Norma Valverde in Hands on a Hardbody, a musical which ran briefly on Broadway in 2013, and is based on the 1997 documentary about real people competing to win a new truck. The TheatreMania reviewer wrote: "Settle, as Norma, steals every scene she's in. The spectacularly bizarre lead-in to her big number, 'Joy of the Lord,' is more difficult to pull off than most Shakespearean monologues, and her solo vocals reveal a soulful, oversized gospel range that drives the Holy Spirit straight to the back of the theater. When she tearfully realizes what her faith in God may have wrought, it stings like a chigger bite. Settle's touching performance should go on the shortlist for every Best Featured Actress prize in town." For this role, Settle was nominated for the Outer Critics Circle, Drama Desk, and Tony Award for Best Featured Actress in a Musical. Additionally, she was awarded the Theatre World Award for Outstanding Broadway or Off-Broadway debut performance during the 2012-13 theatrical season. Settle played the role of Madame Thenardier in the revival of Les Misérables, starting in March 2014, and ending on March 1, 2015. Settle originated the role of Becky in the musical Waitress, which opened on Broadway on April 24, 2016, at the Brooks Atkinson Theatre after premiering at the American Repertory Theater in August 2015. Settle played the role of Tracy Turnblad in the national tour of Hairspray. In the review of the tour stop at the Kennedy Center in 2005, the Washington Post reviewer wrote: " As for Settle, she is a fine Tracy, even if she looks too old for graduate school, let alone high school." She appeared in the national tour of the Lincoln Center production of South Pacific as Bloody Mary, starting in 2009. The reviewer for the Pioneer Press, Massachusetts, wrote: "Better cast is Keala Settle, who plays the conniving Tonkinese trader lady Bloody Mary with a rolling gait, the venom of viper and—buried deeply but achingly visible in strategic moments—the maternal fierceness of a lioness." In November through December 2012, Settle played the role of Mrs. Fezziwig in the Pioneer Theatre Company (Salt Lake City) production of the musical A Christmas Carol. She played the role of the Narrator in Joseph and the Amazing Technicolor Dreamcoat at the Ogunquit Playhouse, Ogunquit, Maine from July 31 to August 25, 2013. Settle performed in the Encores! concert staging of Violet on July 17, 2013 with Sutton Foster, but did not move on to the Broadway revival due to taking the role Madame Thénardier in the revival of Les Misérables; she was replaced in Violet by Annie Golden. Settle discussed her career path, noting that "...I really am not a musical theatre performer. I'm more an R&B singer and have been doing that my whole life. My mother is—well, was—also an R&B singer, in New Zealand....I was too busy wanting to sing backup or doing studio work singing chorus stuff, and singing backup for Gladys Knight in Vegas." Further, after her run in Hairspray, she stated that she "...didn't know how to live in that world..." and so for several years worked backstage with designers until she was cast in South Pacific. In 2017, Settle portrayed Lettie Lutz, a bearded lady, in the biographical musical drama film The Greatest Showman, alongside Hugh Jackman, Zac Efron, and Zendaya. The song "This Is Me" from the film, principally sung by Settle, won the 2018 Golden Globe Award for Best Original Song and was nominated for the Academy Award for Best Original Song. On December 22, 2017, she released an extended play entitled Chapter One. In 2018, she was featured in Forbidden, the newest Todrick Hall visual album, especially in the song called "Forbidden", a song against homophobia. In 2019, Settle played the role of Cy (a gender-flipped version of Paul from the original, also combined with soloist 1) in Fox's Rent: Live. "Til I Get to You"
"It Ain't Over 'Til the Fat Lady Sings"
^ Gans, Andrew (2013-04-22). "Outer Critics Circle Nominees Announced; Pippin Earns 11 Nominations". Playbill. Archived from the original on 2013-04-25. Retrieved 2013-04-27. ^ Gans, Andrew (2013-04-29). "Nominations Announced for 58th Annual Drama Desk Awards; Giant and Hands on a Hardbody Lead the Pack". Playbill. Archived from the original on 2013-05-01. Retrieved 2013-04-29. ^ "Tony Awards 2013 nominees: Complete list". Los Angeles Times. 2013-04-30. Retrieved 2013-04-30. ^ Gans, Andrew (May 7, 2013). "Tom Hanks, Bertie Carvel, Valisia LeKae, Rob McClure and More Are Theatre World Award Winners". playbill.com. Archived from the original on 2013-06-07. ^ Gioia, Michael (November 30, 2012). "Alan Menken and Lynn Ahrens' Christmas Carol, With Kevin Earley, Laura Hall, Opens Nov. 30 in Salt Lake City". Playbill. ^ Gans, Andrew (July 31, 2013). "Clay Aiken and Keala Settle Star in Ogunquit's Joseph and the Amazing Technicolor Dreamcoat, Beginning July 31". Playbill. ^ Gans, Andrew (July 17, 2013). "Sutton Foster, Joshua Henry, Van Hughes, Keala Settle, Christopher Sieber Star in One-Night-Only Violet July 17"". Playbill. Archived from the original on 2013-11-03. ^ Gans, Andrew (March 8, 2013). "Diva Talk: A Chat With Hands on a Hardbody Star Keala Settle". Playbill. ^ Grobar, Matt (November 17, 2017). "The Greatest Showman Songwriters Benj Pasek & Justin Paul on the Revitalization of the Original Hollywood Musical". Deadline Hollywood. ^ "PRISCILLA Cast Album Debuts at #1 on Billboard Charts". April 13, 2011. Retrieved March 24, 2019. ^ "Billboard 200 Chart Moves: 'Waitress' Cast Album Debuts, The Lonely Island & Rebelution Make Waves". June 17, 2016. Retrieved March 24, 2019. ^ "IRMA - Irish Charts". www.irma.ie. ^ "2018年02月26日～2018年03月04日 オリコン週間 CDアルバムランキング". oricon.co.jp. ^ "국내 대표 음악 차트 가온차트!". gaonchart.co.kr. ^ "the greatest showman | full Official Chart History | Official Charts Company". officialcharts.com. ^ a b "Gold & Platinum - RIAA". ^ "Gold/Platinum - Music Canada". musiccanada.com. ^ "Billboard Soundtrack Albums Chart". February 16, 2019. Retrieved March 24, 2019. ^ "Chapter One - EP by Keala Settle". 22 December 2017. ^ "Music: Top 100 Songs | Billboard Hot 100 Chart". billboard.com. ^ Hung, Steffen. "australian-charts.com - Australian charts portal". www.australian-charts.com. ^ "Canadian Music: Top 100 Songs Chart". billboard.com. ^ Hung, Steffen. "lescharts.com - Les charts français". www.lescharts.com. ^ "Offizielle Deutsche Charts - Offizielle Deutsche Charts". www.offiziellecharts.de. ^ "Billboard Japan Hot 100 | Charts | Billboard JAPAN". billboard-japan.com. ^ "Gaon Download Chart – Issue date: 2017.12.24 – 2017.12.30"
^ "Official Singles Chart Top 100 | Official Charts Company". www.officialcharts.com. ^ "ARIA Chart Watch #502". auspOp. December 8, 2018. Retrieved December 8, 2018. ^ Hung, Steffen. "charts.org.nz - New Zealand charts portal". charts.org.nz. ^ a b "NZ Heatseekers Singles Chart". Recorded Music NZ. January 8, 2018. Retrieved January 17, 2018. ^ a b "BPI Awards - bpi" (To access, enter the search parameter "Zendaya" and select "Search by Keyword"). British Phonographic Industry. Retrieved March 9, 2018.